well what can I say? Inspiration took hold of me and there was no stopping me. There is a divine hooping goddess in Melbourne Australia, who shares her love of hooping by posting weekly tutorials on line for the world to enjoy. I have already learned so much from her that I will always be eternally grateful. I was hooked. Of course I had to make one. I was so proud of myself it forced me to ask the obvious question. Hey Carole, if you enjoyed making it so much why stop at one? Why not make another one? The instructions use old t-shirts but I had none available so the purple is from a shawl which I was never going to wear (for one reason or another) and the red is left over from a skirt I made during the summer. The beads are from a necklace I was going to throw away. 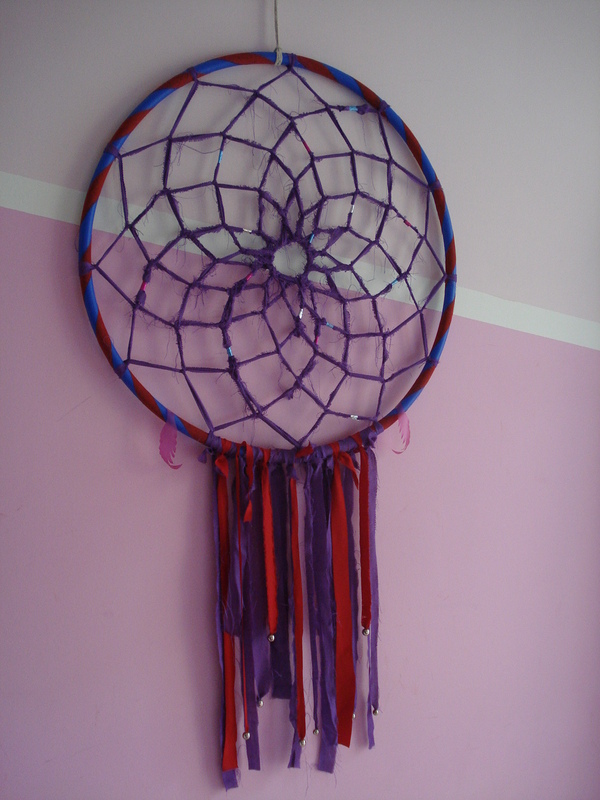 The feathers were easy to make but I didn’t feel inspired to add more so stopped at four. The hoops were bought on line about a year ago and totally unsuitable for anything I do, so I was happy to use them here. Once I started cutting I discovered that the shawl fabric was obviously not intending for slicing because it frays considerably, leaving strands of threads in all directions. If you were to look closely (and I’m not suggesting that you do that for a moment) you will see that it lends the finished product with something of a wispy quality, which I find endearing and perhaps appropriate for the dream theme. The fact that I’m happy with them is a demonstration of how I’ve changed from insisting that everything be neat and perfect to appreciating the joy and fun of the whole project. I love them. Thanks Deanne, you’re a star and an inspiration, bless you. So I was in my local park a couple of weeks ago, just enjoying myself, spinning a few circles, having fun with my toy, when I noticed that a small person several metres away had escaped from his adult person and was making a bee line for me across the grass. He looked like a baby with a mission because no matter how much the lady called him, he ignored her, fixed his attention on me and walked (you know that adorable wobbly way that little children do) right towards me. Of course I stopped hooping and watched him approach knowing that for someone of his young age there could only be one of three things on his mind. Firstly, he didn’t look tired so I knew he didn’t want to sleep, secondly he didn’t look hungry and I had no food visible anyway, so I ruled that out as a possibility, thirdly I was playing and surmised that my hoop was the object of his attention and perhaps he wanted to play too. With the lady some distance behind him, he made ground for someone so small and when he was just in front of me I held out the hoop. He grabbed it and plonked himself down on the grass. 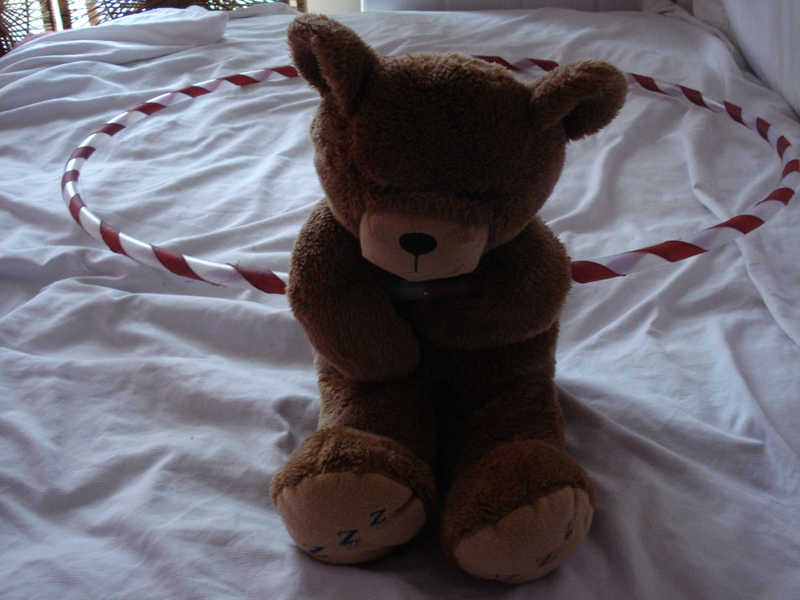 This picture is an attempt to recreate the scene, bear for baby, duvet for grass, hoop in situ, I assume you’re with me so far. I have no idea why it took the lady so long to catch up with him but she eventually arrived, pleading apologetically and upset with the baby for interrupting me. She seemed convinced that he was disturbing me and at that moment her assumption was her excuse to be agitated. I assured her (or at least tried to assure her) that I wasn’t the least bit bothered. I mean, why would it bother anyone, he was adorable. Her apologies continued but I couldn’t help laughing at the cute little person on the grass, grappling with my hoop. I was happy to watch him and he was obviously happy to play with the tube of plastic, he rolled under it, crawled over it, picked it up and somehow managed to flip it, even though it looked huge and awkward in his little hands. Question seventeen: was the baby happy because he was playing or was the baby playing because he was happy? Question eighteen: does it matter? 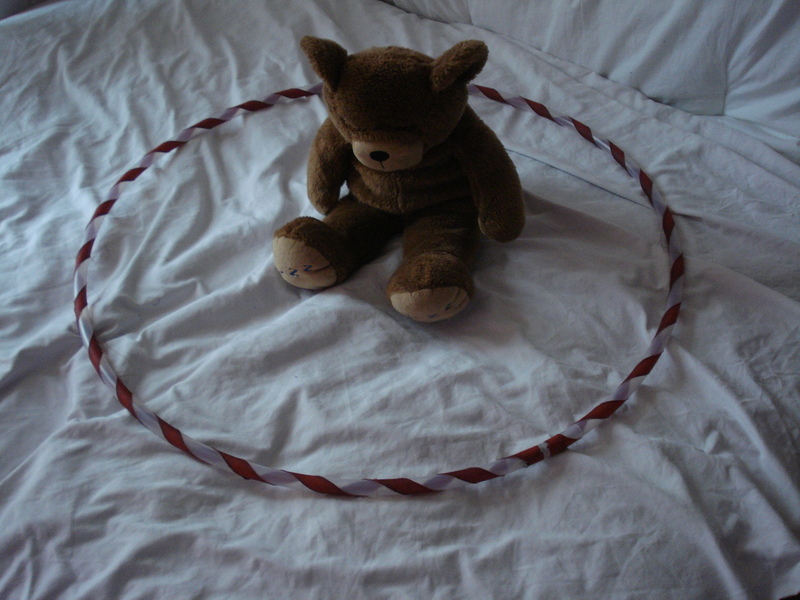 It was a delightful moment and I had fun until his adult tried to take my hoop away from him. Why was she doing such a thing? What on earth was she thinking? I intervened and pointed out that we could see he was happy, I wasn’t bothered and there was nothing for her to concern herself about. When I also pointed out that he at least he wasn’t crying she seemed to snap out of her anxiety and calmed down enough to have a conversation with me telling me that he was her one year old grandson, that his mother was at the other side of the park, that he was ‘a bit of a handful’ and she never knew what to do when he cried. Like most (if not all) little people his attention span was limited and moments later he stood up and without so much as a glance in our direction he walked away. So as sweet as the whole experience was, I found myself reflecting on the scene that had taken place. Anyone who knows anything about small people will be quite aware that they seldom leave their family member to go to a person they have never met before. When left to choose for themselves they are most particular about the company they select. That little boy came willingly and without hesitation. He wanted to play and the fact that I was a stranger was of no concern. I never cease to be amazed by how readily children come to me and this is just another occasion to make me remember how blessed I am. Thanks for joining me during this brief return to a recent event, I’ll share another experience some other time. For the moment, I thank you for visiting and reading and bless you all. So this joy for hooping has kind of caught me by surprise and I had no idea it would press my spiritual buttons. Firstly the way it feels sooooo good has been a bit of a shock. I knew I enjoyed spinning from the whirling and twirling of my jive and salsa days. (To be fair there’s not a lot of spinning in the world of tango but the shapes are very interesting so perhaps more about that another day.) Anyway, I had no idea that spinning with just a tube of plastic could feel as good as being led into a spin by a fabulous leader. There are lots of connections I could make with my spiritual learning but for today I’m inspired to marvel at some of the names of hooping moves, which add to the spice of this fun activity. There’s the vortex which made me laugh when I heard it, just because I’m a fan of Abraham-Hicks and they talk about the vortex in their teachings, hey they even wrote a whole book about it which comes with a guided meditation CD. Then there’s the mandala which made me laugh too because as part of my spiritual awakening, I started painting a few years ago and mandalas feature heavily in my meditation inspired art. 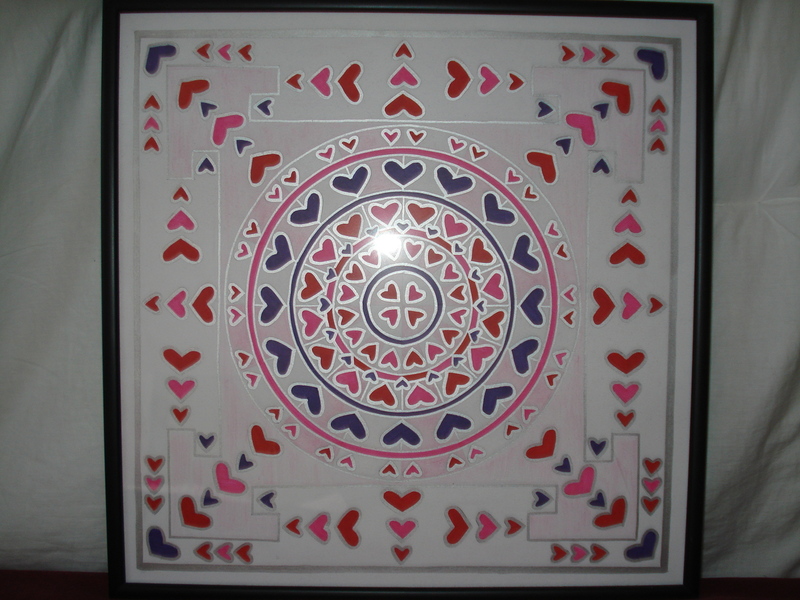 Here’s a love mandala which evolved over several weeks and I created it long before I renewed my relationship with the hula hoop. Sometimes, I like to think that my love affair with the circular tubing has in some way resulted from my concentration on this very love mandala. So the vortex and the mandala are great moves and learning them along with their many variations keeps me entertained as I endeavour to grow, learn and improve. 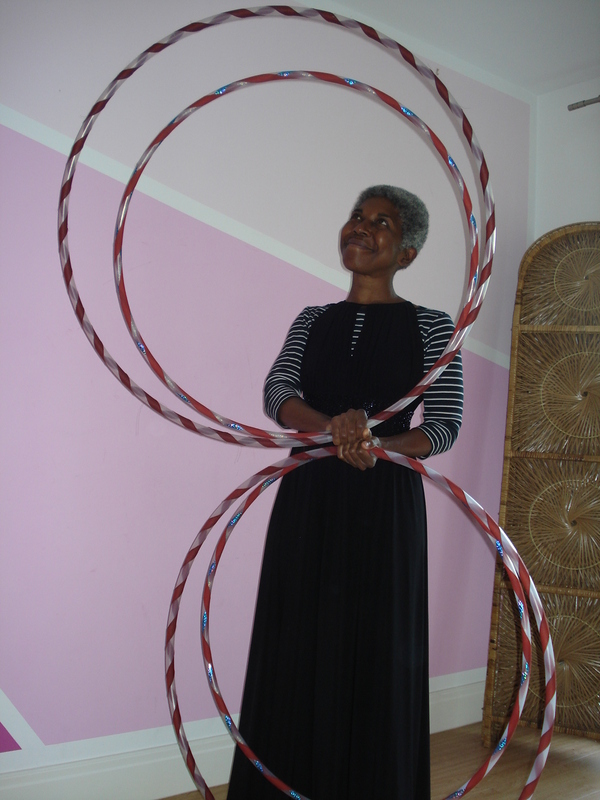 I’m eternally grateful to the wonderful Deanne Love of Hooplovers because she introduced me to the magic world of hooping mandalas and I just love how it feels to spin them. She has no idea who I am but I’ve learned lots from her, I hope to meet her and thank her personally one day. I’m also eternally grateful to the wonderful Jon Coyne of hoopsmiles for teaching me the vortex because I just love how it feels to spin them. He also has no idea who I am but I’ve learned lots from him, I hope to meet him and thank him personally one day. 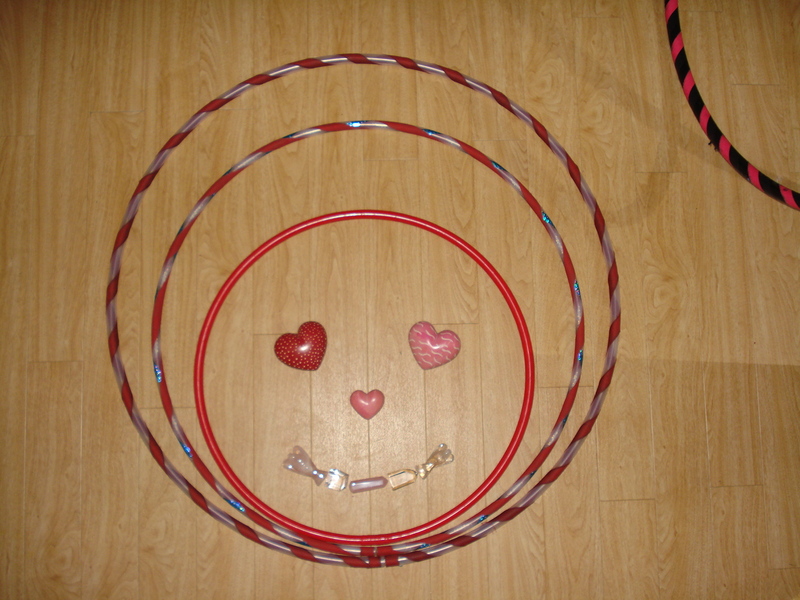 The internet is a wonderful thing because I’m in London, Deanne is in Melbourne and Jon is in Seattle but thanks to their generosity of time and energy, I can benefit from their online tutorials and enhance my joy of life and love my hooping even more. That’s enough for today folks, thanks for joining me and I’ll be back when the inspiration grabs me. Well I meet a lot of people as I go about my day and my interactions with strangers have been a fun part of my life for a few years now. Some of the fun I have is hoop related so I feel inspired to share a recent episode here with you. So last Tuesday morning I was on my way home after a sunny session of spinning circles in my local park, when I decided to pop into a grocery shop to buy a couple of bits. That was fine by me, so I held it out for the happy, smiling man but he changed his mind and announced that he couldn’t keep it up, which made his friend laugh out loud and choke on his cigarette. Well whether they were serious or not, I wasn’t about to turn into a pavement performer for various reasons so with a smile, I continued walking. I laughed and told him I just do it because it’s a lot of fun. I said goodbye, turned and disappeared into the shop. I made my choice and joined a short cue at the till to pay for my bread and cheese. I turned to see the face of my jovial builder chappy standing right behind me and I mean right behind me. Hey, I’m not saying he followed me but there he was smiling away with the same big beaming smile that he had outside on street. Amused by his sudden appearance I laughed and said that bread and cheese are my favourites. Between you and me, that’s what my intellect was saying but my heart was saying thank you to the Universe for sending me a wonderful man ticking so many of my boxes. Come on folks, I mean just imagine, he’s friendly, chatty, smiley, bold, confident, fun, playful and good with his hands. When he followed up with an admission that he doesn’t really juggle I lost all interest, never mind we were close but not close enough. Strangers can be so much fun, I laughed to myself all the way home. Hi there everyone hope you’re all having fun. 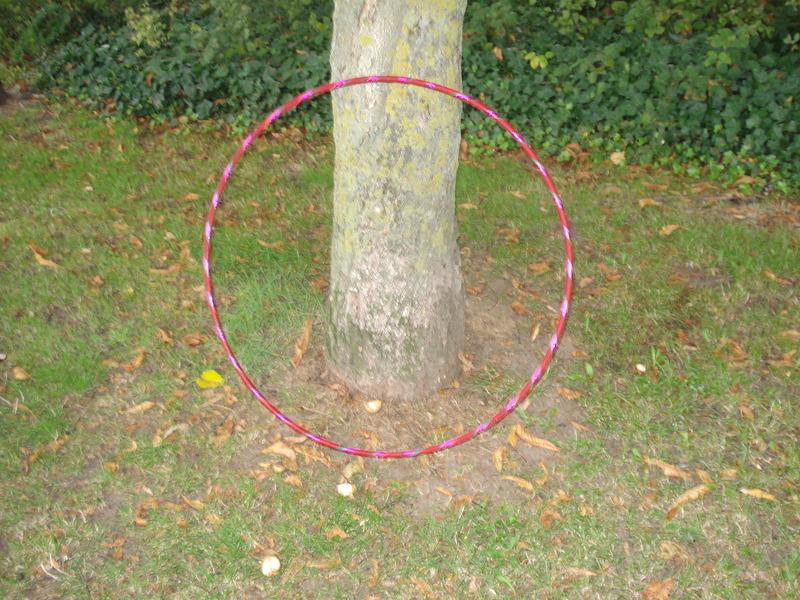 So now that I’ve got this whole doing things “like no one’s watching” down to a tee, I can enjoy my outdoor hooping in the way my inner child wants me to be. Running, skipping, jumping, dancing and hooping just like a child, all carefree and joyful. There is something so liberating about being in the open air, lots of space, grass and trees with my imagination and a hoop or two for company. Does life get much better than that? Years ago I discovered that life is supposed to be fun (Abraham-Hicks) and I fully embraced the idea. Perhaps this light hearted attitude is one of the reasons strangers talk to me so readily. There may be other reasons but I don’t try to figure it out, I try to just enjoy it. 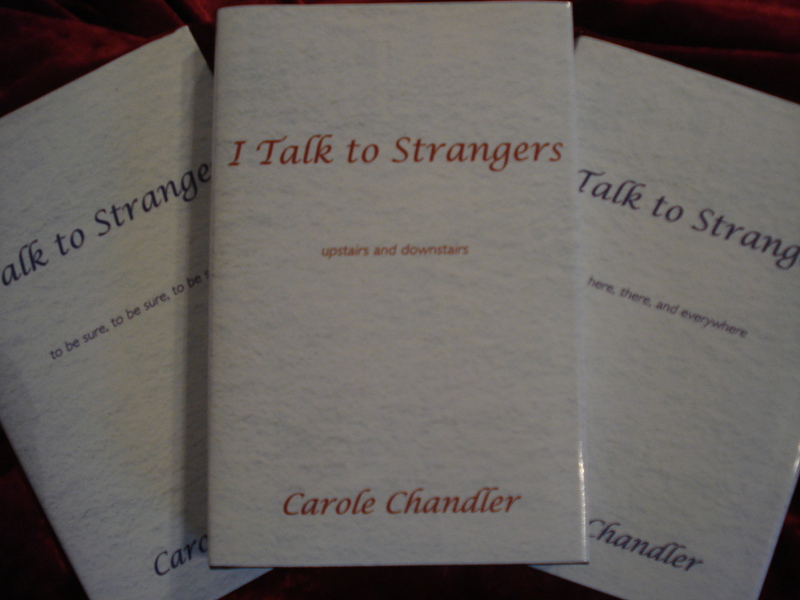 Strangers have been responding positively to me for many years now and they seem to find many reasons to talk to me. My experiences have been sometimes unusual, always fun and frequently fascinating and I’ve been inspired to share several in my books. These encounters happen often and now many of my interactions with random people are hoop related but not exclusively. Here’s a quick example, a couple of weeks ago I was walking home from my therapy room in Wimbledon after a fabulous morning of reiki and massage, when a man cycled past me, slowed down and turned back to smile at me. That in itself was not enough to surprise me because it’s happened before many times. He slowed down and stopped, as I continued to walk towards him, he said hallo, I thought nothing of it and said hallo back. It’s common for me to engage in conversation quite randomly with people I don’t know and I rarely think of a reason not to respond to someone, especially if they smile and say hallo to me. I tend to just go with the flow. Not everyone agrees with my way of being but that’s okay. Not everyone thinks like me but that’s okay. Not everyone sees the world like me but that’s okay. Not everyone has learned to trust universal forces like I do but that’s okay. Well this made me laugh because I had no idea who he was and I wasn’t carrying a circle, so it took me a moment to make a connection. He seemed happy that I remembered him, I’m actually astonished that he recognised me particularly out of context. Anyway, the previous time he spoke to me was a Sunday morning about 7.30am on my way to the park, when he attracted my attention to tell me he’d seen me before and wondered if I teach or perform somewhere. No, I assured him it’s all just for fun. He said lots of complimentary things and that he felt inspired to try hooping one day. I mean really folks how nice is that? How nice that a stranger saw me and wanted to chat to me. He had no reason to strike up a conversation with me, he could have thought whatever he was thinking and gone about his day without sharing his thoughts with me. Meeting him was fun, meeting people is always fun, meeting strangers is always fun, I usually never see them again and that’s okay. I’m looking forward to chatting here about the people I meet and the fun I have. That’s all for now folks, have a great day no matter where you are, no matter what you’re doing, no matter who you’re doing it with. So I’ve happily modified my thinking to bring myself to a place where I can hoop like no one’s watching. It’s a great way to take the pressure off and relax into the moment. This is particularly useful for me because during the last year or so, I’ve developed a passion for hooping in my local park. Like I said in an earlier post ‘time moves on’ the idea didn’t come easily to me at the beginning, so I found trees to hide behind early in the morning to reduce the chances of being spotted. The urge was strong to conduct my beginner practice out in the open air but the thoughts of judgement from others kept wafting over me. Then I remembered my wonderful dance floor experiences. Ooh they were wonderful indeed. 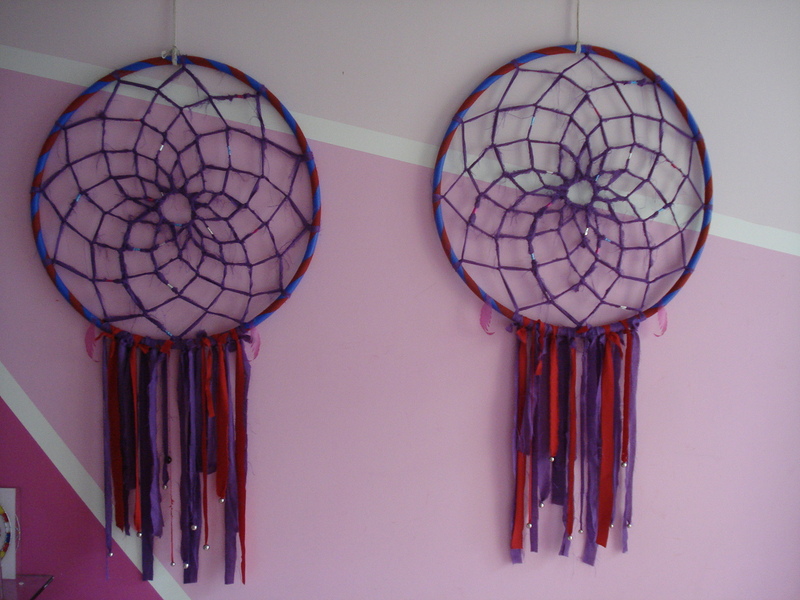 Ah, I can dream myself away easily just thinking about so many amazing dancing times. I remembered how I transformed my enjoyment of social partner dancing when I discovered how to ‘dance like no one’s watching’. It was a liberating perspective and one which transformed my life. Question fifteen: did my life transform because I changed my perspective or did I change my perspective because my life transformed? Question sixteen: does it matter? Well, now that I’ve drifted off a bit, I feel like sharing a few words about my previous dancing fun, which are only previous because I’m totally smitten by the hooping bug but I guess you could have figured that out for yourself. Anyway, if you’re content to take a little wander with me down a movement to music inspired memory lane, grab yourself a cup a peppermint tea and an almond croissant, make yourself comfy and let’s see what transpires. Many moons ago, a wonderful friend and partner at the time suggested we take ballroom and latin classes together. He had tried a couple of times in his youth and seemed to think I might enjoy it. He was right, it was more fun than I could have imagined but that was probably because I had no idea how much more fun was on the way. Time passed, he lost interest, I continued without him and fell more in love with the variety of skills and techniques and more importantly the feeling of the dance. More time passed, one of my pals at the dance school introduced a couple of us to the world of modern jive and a new me was born. Wow, the other stuff was great but I found that I loved the freedom that came from this new less formal dancing with friends and lots of strangers in a variety of venues. I discovered parts of London which I never knew existed and danced my proverbial socks off. I was lucky enough to be whisked around the floor by a plethora of adorable, proficient and skilled dancers who knew how to lead and wow they could lead really well. No matter where I went I just had more and more fun. However, you know what they say, ‘nothing lasts forever’. People started to drift away to other disciplines and some of my favourite leaders defected to the worlds of West Coast Swing and Argentine Tango. I can’t say much about WCS because although I simply adore the way it looks, I never felt it. I had one lesson and that was enough but that doesn’t stop me appreciating the beauty of it. Years ago, I fell in love with a special, very special performance by Jordan and Tatiana and watching it still gives me goose bumps even after all these years. It may be old but never feels old to me. Argentine Tango is a different story. A group of modern jive friends talked about it so much I gave it a go myself after much persuasion I can tell you. I just wanted to see what the fuss was about and once I started I loved it, really loved it and tango classes took me to even more areas of London which were new to me. I don’t think I’ve ever done so much driving to new places. It was oodles of fun to dance with people who were excellent at jive and tango in both types of gatherings. What a treat that was. I was fortunate to have many favourites and one of them loved both dances so much he started providing online information to help people ease the transition from jive to tango. Like that wasn’t enough he now has his own business teaching tango classes and workshops. How cool is that? I would struggle to find anyone more passionate about this unquestionably intoxicating dance, so everyone is lucky that he’s sharing his skills and gifts so well. Well done David, you’re a star. I attended lots of classes all over London and neighbouring counties, soaking up all I could learn from a variety of talented instructors. My last teachers were the wonderful Kim and David and I adore their friendly, inclusive teaching skills and their inspirational dancing style. One of the highlights for me was at the end of each lesson they would dance for the pupils, just for a couple of minutes and it was pure bliss to witness such elegance, grace and beauty. They are a simply adorable couple and I’m sure I’ll always have a soft spot for them when I enjoy fond memories of my adventures with Argentine Tango. No matter how much I loved it there was something not quite working for me. AT is truly delightful but my experience is that I’m getting less serious as I get older (much to the dismay of my children) and even though this beautiful dance feels divine, I confess that the culture which surrounds it, is just simply too serious for me. I’m attracted to fun music and fun clothes and fun activities and I want to laugh more and skip more and play more. I’ve just stopped taking myself seriously, so AT had to go. During my last year of all of this social partner dancing stuff, I added salsa to the mix of dance fun. I gave it a really good go and loved that too. I had many great experiences at salsateca classes adoring the teachers, venues and atmosphere. Elder Sanchez runs the classes around London and he’s a wonderful man who has successfully surrounded himself with an equally wonderful set of teachers. I enjoyed finding that salsa and bachata were another sublime way to discover self-expression. So many people having so much fun, what could be better? At the Clapham class, I was surprised to find a teacher taking my group, with a hint of a spiritual edge. I thought my imagination was playing tricks with me when I heard him say the first time, “practise, practise, practise until you find the truth”. That wasn’t even a one off, to my joy he thrilled us by saying it often. What a gem. It was fantastic to hear someone speaking my language. I’m not sure it had the same effect on other people but I adored hearing him say it. A couple of years ago I made a concerted effort to enjoy my dancing more, so in addition to classes and freestyle nights throughout the year, in the spring I went to an AT weekender in Dublin, Ireland, it was brilliant. In the summer I went to a salsa weekender in England’s wet and windy Wolverhampton, never mind the weather the dancing was also brilliant. In the autumn I went to a jive weekender in Torquay on what is lovingly known as the English Riviera, a beautiful seaside resort in England’s gorgeous county of Devon. All the dancing there too was brilliant. I remember them all fondly, a great time was had by all especially moi. Salsa was fun, AT was fun, jive was fun, all fabulous places, fabulous people, fabulous music, fabulous dances, I adored them all, yet one thing led to another and they are no longer an integral part of my amazing life. I’m grateful to everyone I have ever met, at any venue, at any time because you have all contributed towards making my current enjoyment the pleasure that it truly is. Without dancing I suspect I wouldn’t enjoy my circle time nearly so much. Question seventeen: am I enjoying my hooping because I dance or do I dance because I enjoy my hooping? Anyway, I’m glad I shared all that because they are happy memories and between you and me, happy memories are the only memories which I’m prepared to entertain. They’re happy memories of learning how to express myself to music and “dance like no one’s watching”. Now that I’ve incorporated the same attitude to my hooping, I can disappear into the privacy of my own mind and “hoop like no one’s watching”. As a result, I’m even more in love with my circles. 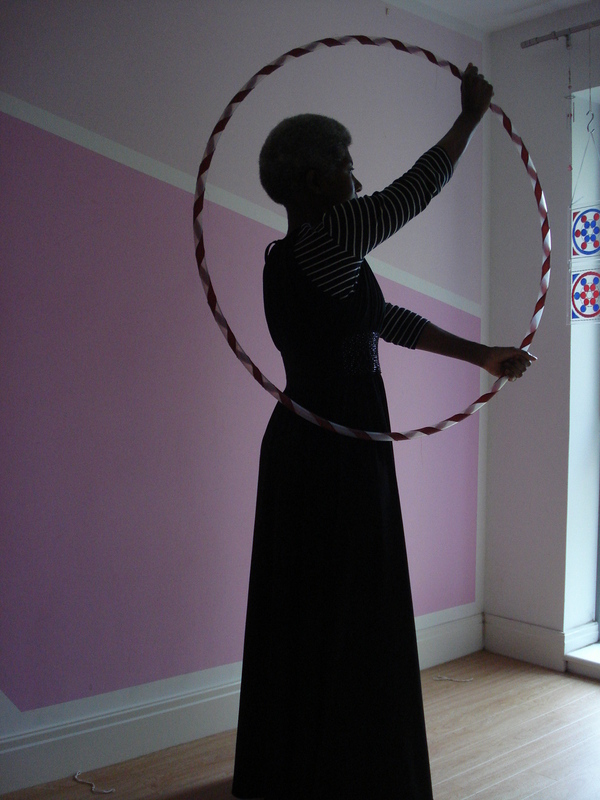 So for any of my readers who have not yet dipped a toe into the world of dancing or hooping and you fancy giving them a go, prepare yourself for a mixture of fun and frustration, the proportions of each will be your personal choice. If any of you are already dancers or hoopers then you will know exactly what I mean. No doubt I’ll say more, much more about keeping the frustration to an absolute minimum some other time. That’s enough for now folks, back when the mood takes me. Before I go perhaps you might like to join me in a celebration of the abundance of links which are sprinkled throughout this mega post. Some of you may see them as decoration, some may see them as information, I’d like to see them as an opportunity to embrace the magic of modern technology. This linking ability allows me by the click of a button, to fully share my appreciation and love for the many amazing people and places which have filled me with warm and fuzzy feelings during these reminiscences. The internet is a wonderful thing. Thank you for joining me. Have a great day doing something you love and if it works for you, do it “like no one’s watching”. So now that I’m in love with this hoop feeling I want to share it with anyone who will listen. I have tested my children to the limit they listen politely because they love me but they don’t really get it. I have friends who listen politely because they love me but they just don’t get it. Of course when I meet hoopers we talk about hooping and we hoop and we talk and we hoop. However, sometimes I wake up in the morning thinking about hooping and I feel inspired to share a few words, so for me this blog is just another form of hoop expression. This is unlikely to be a place where I will post film of my circle related progress, achievements or challenges. There are thousands of those on the world-wide-web, so you don’t need mine. This is unlikely to be a place where I will post photographs of a scantily clad goddess posing with the circle. There are thousands of those on the net, so you don’t need mine. This is likely to be a place where I will post musings about the spirituality of this amazing activity. I was a happy, daily fan of meditation before the circle joined my life. Now spinning within is one of my forms of tuning myself to higher realms of consciousness. If you are already one who meditates regularly then you will understand what I mean. If you are one who hoops and meditates then you will already experience what I mean. There is something about the hoop and body spinning, whirling, gyrating and twirling that transports your mind to some other place. If you’re not one who meditates then you can just ignore all of that and know that hooping just feels nice anyway. Besides it’s so much fun that it’s hard to care about anything else so the effect is the same whatever you call it. One of the many wonderful hoop instructors who happily shares internet tutorials has this great video which makes me laugh every time I watch it. He rejoices in the name of hoopsmiles (like I said before, I just love some of the creative names that hoop professionals give themselves). I’d struggle to find a better introduction for the world of hooping, so I hope you enjoy watching it as much as I do.